While 1066 is one of the most famous dates in English history, many do not know that there were two battles that year, both of which were decisive and truly changed the course of history. With the death of King Edward the Confessor in January 1066, one of those that coveted the throne of England was Harald Hardrada, King of Norway. In September of that year he landed in the north of England with a Viking army, including men from his possessions in Orkney and Shetland, along with some Scottish soldiers, and joined up with an exiled English Earl, Tostig Godwinson (brother of the new king Harold Godwinson), who had raised a small force of Scots and Flemish mercenaries. After initial successes this force was surprised, divided and without full armour, by an army rushed north by the English King Harold, and comprehensively beaten at Stamford Bridge in Yorkshire. The scale of the disaster was such that both Harald and Tostig were killed and the survivors allegedly needed less than one in ten of the boats they arrived in to go back to Norway. This defeat is sometimes claimed, with more than a little exaggeration, to mark the end of the Viking age, but it certainly was a major milestone in that decline. Much of this set is made up of figures previously released by Strelets. These are two sprues from M003 - Anglo Saxons, two of M050 - Anglo Saxons Before Battle and three of M004 - Vikings. The new sprues contain just the figures pictured above, so we will concentrate on just them - refer to the original reviews for our comments on the older sets. Based on certain features on the figures and the colour of the plastic, it would seem that the grey figures are the Norse and the brown ones are the Anglo-Saxons, but to a considerable degree this is an artificial distinction. In reality most of these figures could probably pass for either side, since the links between England and the Norse had been strong for a long time. Regardless of their nationality, these men would have worn basic peasant costume of tunic and trousers with leather shoes and sometimes a cap or hat. Those that could afford it might wear armour of some description and/or a helmet, and the weapon they carried would also be largely a reflection of their wealth. Mail would have been the most common form of body armour, as it is on these figures, though a surprising number here wear lamellar armour. Some of the grey figures wear helmets with the 'spectacle' face-piece, which is certainly known to have been worn by the Vikings (though perhaps only a little later), though it is not impossible that some Saxons also wore it, and we can never know how common it was in either army. Several of the grey figures are also stripped to the waist, which brings to mind the popular but not necessarily correct image of a Berserk. Whether these figures are appropriate for Stamford Bridge has to be doubted, though there must have been occasions around these years when men had to reach for weapons with no time to don armour or even tunic. Several of the figures have gone the other way, and wear fur covering the trunk. This really pushes credulity too far, not least since the day of the battle was remarkably warm, but also because this just seems too old-fashioned for the later 11th century. Strelets have taken the opportunity to introduce some nice 11th century command and speciality figures on the single sprues here. Amongst the brown figures there is a particularly splendid figure with sword raised that could easily pass as a commander, and also on show are a man signalling with a horn, another with a draco standard and a third with a banner of a design known from Viking sources and so feasible for Saxons too. The rest of the 'Saxons' are generic warriors, some of which have rather flat and unconvincing poses, but there are some good ones there too. 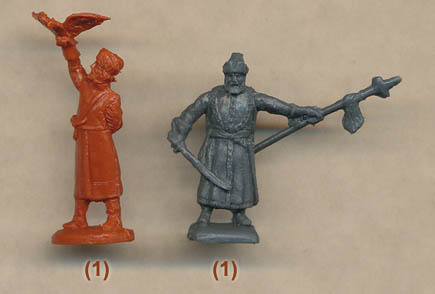 The single grey sprue contains the 'Berserks' plus a figure wearing a crown (extremely unlikely), another holding a standard and blowing a horn, and a nice pair with a warrior helping an apparently wounded comrade. There is also a figure which we initially thought might be cutting his own head off from the back (last full row), but it seems is a warrior (maybe even Harald himself) with an arrow straight through his neck. The chances of an arrow entering, and leaving, the neck at such a perfect horizontal must be slim indeed (if even possible), so we did not care for this figure. While the command poses are generally pretty good, the total selection is mixed, with some very nice ones alongside some quite flat examples (men holding their swords directly over the centre of their heads, for example). Although there are some holding their shield well out of the way, several are actually holding it as you would expect in a fight, between them and their opponent, and look good as a result. For the most part there is quite a lot of action here, and a few even work quite well as part of a shield wall, so mixed results from the poses. The flat or awkward poses somewhat disguise some really nicely detailed sculpting, which is particularly notable from Strelets. Although some of the elements like sword scabbards still tend to be fatter than they should be, there is some very nice textures on the mail and fur items, and for some reason the 'Saxons' in particular have much that is pleasing to the eye. A handful of the grey figures have ring hands, for which there are more than enough weapons which fit well enough, but the level of flash is pretty low, particularly on the 'Saxons'. The hammers carried by a couple of figures are far too early in an age yet to see plate armour, and we have already highlighted a few other elements that seem too early, or too late, for 1066. 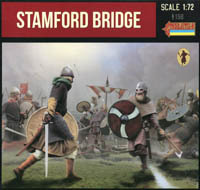 The fact that several of the Vikings have little armour could relate to the surprise nature of the attack at Stamford Bridge, but it is noticeable that all of the brown figures are well armoured and armed (few spears), suggesting they are the higher class of warriors rather than the fyrd, which is partly represented by the older Saxon sets, though there is still probably too much emphasis on the elite warriors here. Ideally some would have had kite shields, which were not exclusive to the Normans, and some of the round shields could have been convex rather than flat, for which there is good circumstantial evidence. The number of axes is good, and a scattering of bowmen is appropriate too, even though they hold the arrow on the wrong side of the bow and their quiver should be cylindrical rather than flat. As a collection of Saxons and Vikings these figures have much merit, though there are too many elements that are certainly or probably not 11th century for our liking, yet that is what the box claims. Older-style armours as seen here are plausible, but too many liberties have been taken generally. Some of the poses are much too flat and awkward, yet some are excellent and cleverly achieved. Detail is generally very good by Strelets standards, with little flash, so those that collect or utilise Strelets Dark Age figures will certainly be pleased with these offerings, and in particular the useful command figures. Not the sort of figures you might choose to put on display, but to help fill a table-top re-enactment of that bloody day in September of 1066 they would do the job quite well. Note The final two figures are of a civilian and an officer from 17th century Russia. Though they are unrelated to the subject of this set, they are part of a series of 'bonus' figures for that period. See Streltsi Bonus Figures feature for details.